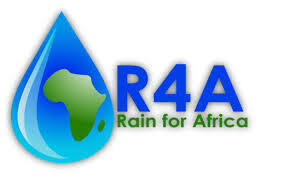 Weather Impact is partner in Rain for Africa (R4A). This project aims at providing agricultural advisory services to farmers based on the best available weather and climate information at their specific location to help improve the quality and quantity of food production in a sustainable manner. Our services assist farmers with determining the best dates to plant, spray, irrigate or harvest. These advisories are made available via the HydroNET webportal, AgriCloud Smartphone App and USSD service. 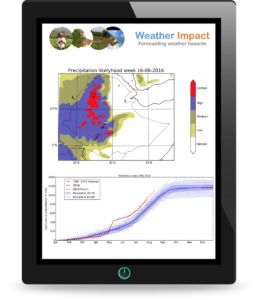 Weather Impact is involved in the development of the AgriCloud smartphone app. This is an app for extension officers with real time planting and spraying advisories for their farmers. 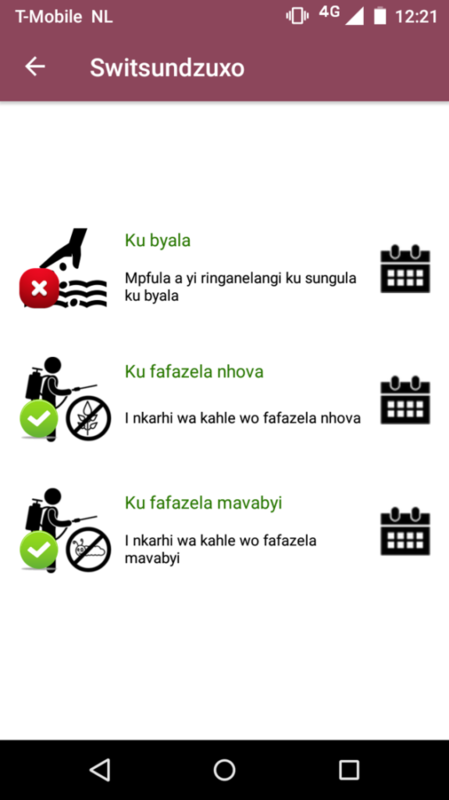 The advisories are translated in 9 local South African languages. You can find the app in the google play store. Weather Impact is partner in CommonSense, a project in Ethiopia that targets smallholder farmers. By providing them with information based on geodata and satellite products, the project aims to strengthen the agricultural value chain. Weather Impact delivers weather information in this project. CommonSense develops a platform of specialized information services including: (1) management of (geospatial) data for unions and cooperatives and (2) dedicated dashboards for monitoring current and future crop conditions including weather forecasts and satellite observations. Weather information, both monitoring and forecasts, are provided on a personalised CommonSense dashboard. Weather information is part of a management system with crop yield forecasts. Weather Impact is partner in the CropMon project. In this project a service is developed that advises farmers, farmer organisations and other stakeholders in Kenya. The CropMon service provides local information on (1) weather forecasts, (2) current crop growth and (3) how crop growth can be influenced by adjusting farm management practices. Weather Impact delivers the weather forecasts and monitors current weather conditions for this service. Farmers receive text messages (SMS) on a regular basis, for farmer organisations and other stakeholders smart phone- and web applications are developed. Satellite, weather and field soil data are combined to monitor the status of crop growth. If satellite observations deviate from reference values, we search for the cause of the deviation, or the factor that is limiting to crop growth. From this information, an advice is given to improve crop growth. The advice ranges from crop or soil management, crop rotation for the following season, irrigation/run off remediation to use of fertilizers or pesticides. Our service is constantly improving, by using farmers’ feedback and collected data. 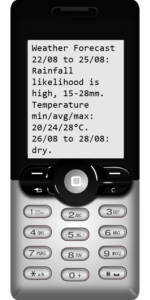 The weather forecasts that Weather Impact provides in CropMon are send to the farmer by SMS. Each farmer gets a personalised messages for his/her area. CropMon and CommonSense are Geodata for Agriculture and Water (G4AW) projects, funded by the Netherlands Space Office. The G4AW projects aim to improve food security in developing countries by using satellite derived information. Weather Impact is involved in several projects in South- and East Africa as the provider of weather information. 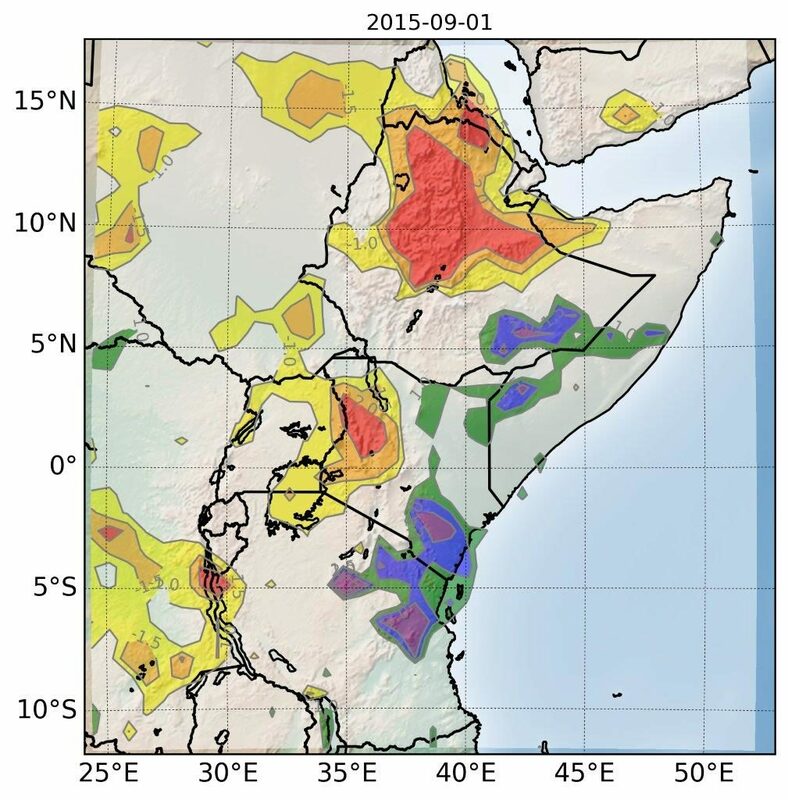 Download here our publication on monitoring of rainfall and temperature patterns in Africa.